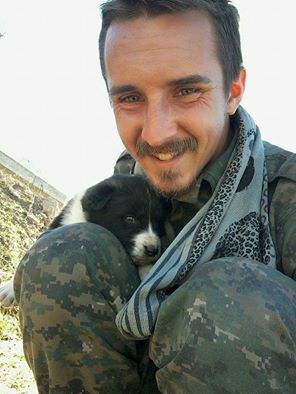 People’s Protection Units (YPG) volunteers, American Michael Israel (27) from Colorado and German Anton Neshek (Zana Ciwan), were killed by Turkish warplanes on 29 November according to another international volunteer fighting alongside the pair against the Islamic State group (IS/ISIS/ISIL), north of Raqqa. [updated]. The YPG have informed both men’s families. According to reports Michael Israel was an anarchist and member of IWW (Industrial Workers of the World). “I am back in Rojava again and will be here for the next several months to do my part in defending the revolution. Anton Neshek is the 4th German to be killed in the ranks of the Kurdish forces. It is not known how many other fighters of the YPG, a leading force in the multi-ethnic SDF which launched the ‘Wrath of Euphrates’ operation to liberate Raqqa from IS, were killed in the aerial attack. Anarchist comrade and member of the IWW (Industrial Workers of the World) Michael Israel from the US has been killed in action fighting alongside YPG / YPJ forces against ‘Islamic State’ fascists in Rojava, Northern Syria. Full details of the circumstances surrounding the comrades death have not been released yet. I am back in Rojava again and will be here for the next several months to do my part in defending the revolution. I’m calling on all of my friends and comrades to learn about the Rojava revolution and how they have been leading the charge in the war against ISIS fascists. I’m calling on all of you who are able, to do your part in helping or sending donations so that this revolution may become stronger with the aid of the international community. This entry was posted on Tuesday, December 6th, 2016 at 9:25 pm	and is filed under Uncategorised.